minuteKEY Introduction video from minuteKEY on Vimeo. New machine is being released to the world that might make key duplication a simpler experience for consumers. The minuteKEY self service machine is specifically designed to be simple and easy to operate, offering a limited array of home and office keys in standard brass or designer keyblanks. This revolution in the key duplication market will change the face of the hardware/key duplication market, speed up consumer wait times and in all likelihood reduce costs as well. It is my understanding that Walmart is soon to be trialling these in select stores. Time for the updated search results that led searchers to this site. February 2011 Top Ten search terms across multiple search engines. Schlage Securekey Problems takes the lead this time but it was a close race with Kwikset Smart Key Problems not so far behind. 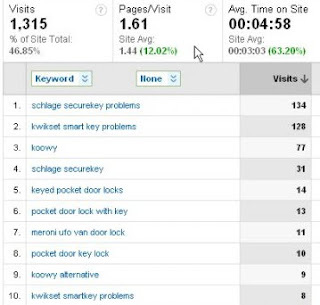 These indices might also indicate that more consumers are experiencing problems with Schlage Securekey products than Kwikset Smartket Products, but that is not a given. Koowy, our article about a small piece of software that we have been involved with as a beta tester has taken third this time. Pocket Door Locks, continue to be an often sought for term, that also lead people here. Sales are through the roof for the product and no wonder. We are expecting replenishing supplies through in a few months, but there will likely be a price rise due to all worldwide costs having increased significantly. Meroni, the highly respected European lock manufacturer gets a mention too. We are expecting hard copy samples very soon. One of the last remaining independent lock manufacturers left in Italy, Meroni is well known across the continent for it's quality and consistency. The above video shows a clear example of how and why window security film is a necessary and wise investment. Protecting property is one of the principle intentions that locksmiths provide. In many neighborhoods across America, residence's front doors are the primary entry point that burglars attack. Secondly, windows are another entry point that burglars attack. Doors that include glass in them or in the sidelights, next to the door, are often only single pane light windows, that can be easily smashed by a would-be intruder and the front door deadbolt turnbutton can be easily unlocked. In most towns across America, the local AHJ (Authority Having Jurisdiction) is usually the local fire marshal or building inspector. These AHJ's base their decisions on the policies and provisions tabled in the International Building Code and ADA (Americans with Disabilities Act), Life Safety Codes and insurance company requirements. Many consumers think that it is okay for them to install double cylinder deadbolts to their primary entrance doors. In most cases this is a fallacy. The law, as determined and judged by the local AHJ, requires all primary entrances in dwellings to use single cylinder deadbolts. The fire departments frown heavily on the use of double cylinder deadbolts because they are a severe impediment to residents easily escaping a fire or emergency. I am asked often and repeatedly by customers to install double cylinder locks. Most often I will refuse and explain in detail why, according to the above. Once explained, the customer usually agrees that complying with the law is far more beneficial and life sustaining than having an insurance claim denied for failing to comply, or worse still facing a possible negligent homicide charge from authorities, simply by having double cylinder door locks installed. So, how do we find a solution that will keep everyone happy? Window security film is definitely the answer. Applying window security film to your vulnerable glass windows can prevent the incidence of smashing entry. It makes your residence comply with the building code, life safety codes, ADA and also sometimes insurance companies may offer a percentage discount on your premium. The security of our families, colleagues, properties is of ultimate importance to us all. Alarm systems cannot protect, they can only inform. How can we feel secure and protected? Shattergard is a product that is especially designed to be installed on windows to prevent the windows from shattering. A new package is being developed to provide this product through the locksmith channel, effectively reducing the price for this ultimate security protection product and providing homeowners, residents and shopkeepers with increased security while still complying with all local rules, laws and ordinances. Door closers have been around for a great many years, providing the ability to automatically return a door to the closed position. Door closers are a very intelligent piece of technology that are often quite expensive. Spring loaded hinges have been around for a little while, but are starting to find their feet in an already crowded door closer market. The intelligence of using a spring loaded hinge makes complete sense, doesn't it? Replaces the existing hinges on doors. Is hidden. Gives the self closing ability without the extra expense and hardware of a door closer. Works on all types of swinging doors including commercial, industrial, residential, hotels, dormitories, gates etc. anywhere a need arises for a self closing door. It is advised to always use at least 2 spring loaded hinges on a door to minimize the strain on just one hinge. Many of the newer types of hinges are tension adjustable, to modify the closing speed and latching action. They are easily installed, usually directly in place of existing hinges. They come in multiple sizes and finishes. They comply with ANSI codes and some are even fire rated to UL listings. There are all sorts of hinges for different applications and with the ability to not have a purpose door closer, can greatly enhance the aesthetic appearance of an entry. Not surprisingly, they are significantly less expensive than purpose built door closers. Service and parts are minimized because they are a very low tech idea. There are very few moving parts meaning replacing worn or broken springs are significantly cheaper than purchasing a new door closer when the fluid leaks or the arm breaks or the adjustment screws cannot be loosened or tightened anymore. I know what I'll be recommending in future. A very interesting and unique security product recently released is making the instances of home invasion virtually impossible. The OnGuard product is a combination of solid materials that when installed correctly virtually renders your door impenetrable. Installed simply and easily by anyone, it is one of the more cost effective security protection devices you will find today. A Madison WI judge has seen fit to convict a dual citizen of both Israel and the USA, for felony ID theft and other related charges. The defendant was also denied a last minute request to leave the USA to return to Israel to care for his ailing father. The charges against Burlin were detailed in May 2009 Wisconsin State Journal articles that tracked his company’s use of phony addresses to attract lockout victims to expensive emergency service, using false names to file negative comments about competitors and putting Capitol Lock and Security, a competitor, up for sale on the Internet. In interviews, Burlin explained that the use of multiple addresses and business names was part of his marketing strategy. The pending civil charges seek unspecified restitution, forfeitures and costs. 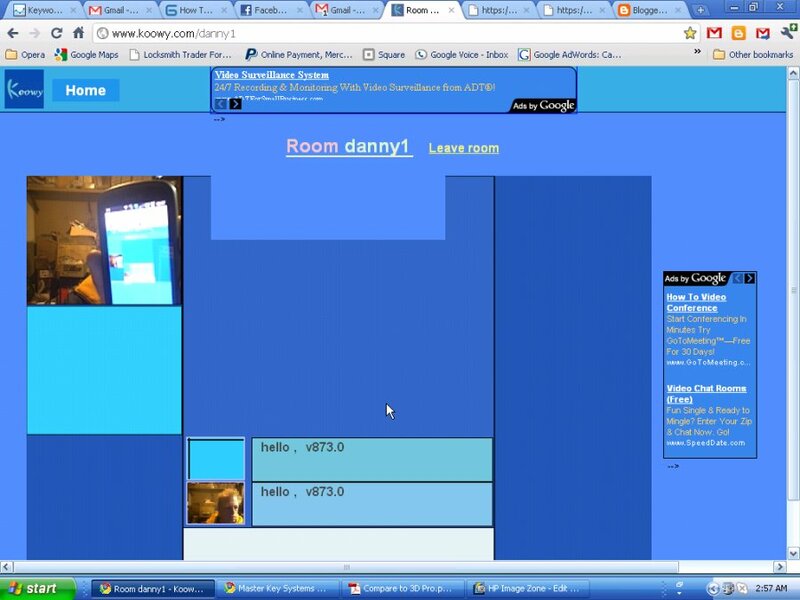 Koowy, the new version of the classic video web communication system Mebeam, is back in use. Now with improvements to the back end and an additional HD quality P2P GUI, allowing high-quality one on one video web conferencing via desktop/laptop. It is suggested that you maintain a fast connection. I tested it this morning using my Samsung Epic 4G connected to wifi. While it still is waiting for the Android 2.2 update (Froyo), it still works reasonably well. You still cannot transmit video from the mobile though. We'll see what happens when and if the 2.2 update ever gets released. The picture below shows it in action. On your desktop, the HD p2p connection quality is superb. Being flash based, allows less demand on RAM, although does require broadband for best results. Once the mobile version is perfected, an app will be developed to take care of the backend. This will show the world, the true purpose of mobile video communication and make it accessible to absolutely everyone with a smartphone. 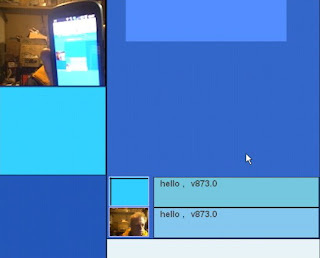 You can choose to send chat messages to your network, with the included chat function. As the largest Bilock Extreme Security dealer in the mid-west, we are now producing limited numbers of our Hybrid Cal-Royal/BilockGrade 3 deadbolt. By replacing the standard cylinder that comes with the LSD-01, with a Bilock Extreme Security Cylinder and 2 keys, we can offer a totally bump proof and virtually pick proof lock with keys that cannot be duplicated for about $140.00 (depending on the color). Yes, it is comparably expensive, but your property is worth it is it not? Dont be fooled by other advertisers claims that their comparison product is pick proof or bump proof or copy proof. There is tons of media out there that proves they are not, but Bilock is the real deal. 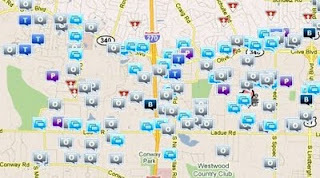 Pictured here is a map of the Creve Coeur, MO municipality and the statistics of crime reported in the source below. from the Creve Coeur Police Department. The Creve Coeur Police Department is well known in the west county region for it's effectiveness on reigning in crime. They are a credit to their funding. 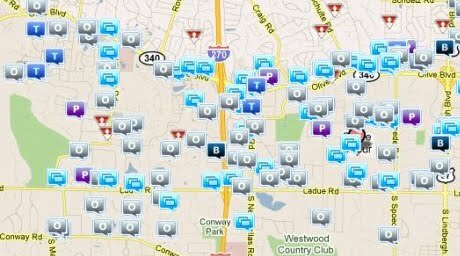 In February 2011, according to the picture here, there were 265 incidents reported to police. These incidents include at least 200 alarm responses that police attended. Police attended to 5 incidents where they wrote Breaking & Entering as the incident. Police attended to 16 incidents where they wrote Property Crime as the incident. Police attended to 39 incidents where they wrote Theft as the incident. There are many reasons that crimes occur. Many of the incidents can be prevented by increasing your security preparedness. An alarm system is one method, but prone to many false alarms. Police attend to monitored alarm calls, but there is usually a cost, borne by the homeowner or resident. Often police will allow 1 or 2 a year free, but regular false alarms add up to significant manpower hours, that are billed to residents. Cost effective security products like door frame strengtheners and quality deadbolt locks are essential to improving the security of your properties. Often these small purchases can protect you and prevent crimes like break and enter. Equally as important are key control systems. Key control systems, restrict the ability of authorized key holders to duplicate keys. Many incidents are happening because owners or managers are unaware of who may have a copy of their key. Preventing unauthorized access to your property significantly reduces crime of opportunity. Choosing the suitable key lock for your door is a process that doesnt really require much thought however, sometimes it can be rather daunting to sort through the literally thousands of options in the marketplace. Many customers choose to source their information online these days and there are many and varied opinions out there offering personal, sometimes biased opinions on what to choose. For these reasons, I decided to write an article about the key points to consider when choosing the suitable lock for your chosen door. Is the door a front or rear primary entrance? - Many AHJ's (authorities having jurisdiction) require dwellings to comply to the international building code, when considering the form and function of a desired key locking product. - A primary entrance is usually considered the feature point of entry into a dwelling. - Authorities having jurisdiction are usually the local fire marshal or local government building inspector. Is the door construction, metal, wood or another material? - Different entrances can be built from different materials, sometimes due to fire regulations or distances to or from another entry point or due to the types of materials or objects stored within that entrance. - There are different grades of hardware measured by ANSI (American National Standards Institute), that are designed to guide people to choosing the suitable quality product that meets or exceeds the customers desires, the building code bylaws, life safety codes or ADA (Americans with Disabilities Act) bylaws. The three common grades are Grade 1 (high quality commercial use), Grade 2 (medium quality commercial and residential use) and Grade 3 (low quality residential use). - Matching the unique style, color or ambience of a doorway is sometimes an important consideration to customers, intent on maintaining a certain status quo of their chosen entrance/s. There are many differing options available to choose from and many hundreds of different manufacturers that make similar or slightly different variations of the same product. Is the ability to limit who can duplicate keys of importance? - Many customers are unaware who has a copy of their keys. Restricting or controlling who can be authorized to duplicate your keys can protect you from potential loss. A key that can be duplicated at any hardware or key cutter means that you cannot control access to your doors. -Locksmiths have been producing key control products for many years that provide the consumer with a level of protection that other hardware suppliers cannot. - There are different functions provided by different models of locks, tailored to many discerning requests. Sometimes it is vital and important for a key lock to only be operated on the outside. Sometimes it is important to be operated from inside too. Sometimes a push or turn button is desired inside, that locks the outside handle. Sometimes a lock is requested that the key can only be withdrawn when locked. - With so many variables, it is important that you explain your desire to the locksmith to allow them to offer suitable solutions. - Securing double doors requires making the inactive leaf (one door) to be closed and secured prior to the active leaf being able to be locked. There are many choices of product designed to secure the inactive leaf, like surface mounted bolts, flush mounted bolts etc. - Securing a door with a key lock is often only half the battle against would be unauthorized users. In many cases, the actual door frame and jamb (where the door closes into) are constructed from light grade, thin materials that offer very little to no protection from kicking or ramming. - Securing the hinge side of a door is sometimes of value too. Installing hinge bolts can prevent a door from being removed when locked after having the loose pin in the hinges withdrawn. - The increasing discussion online about the truth behind the perceived security of key locking systems has led many well known manufacturers to attempt to offer products tailored to combat these known covert entry techniques. Truth be told, there are very few products that can be considered bump or pick proof or even resistant. - Whether or not lock bumping or lock picking is a consideration for the average customer, depends sometimes on the statistics of crime, measured by statisticians. It is very difficult, even for a trained forensic investigator to determine if a key lock has been bumped or picked, with absolute accuracy. - Many authorities, who measure the statistics of crime, often find that instances of lock bumping or lock picking are far too few to measure accurately. Moreover, crime statistics tend to indicate that entrances being defeated are often the result of door frame failure (kicked or pried open), windows smashed or pried or doors being left unlocked. In most places your trained local locksmith is often the best person to consult about suitable options tailored to your individual needs or desires. Most often a locksmith that is affiliated with a known professional organization, has proven credentials supporting their training. Weeding the professionals from the wannabe's is sometimes a difficult task. Choosing your professional is accompanied by risks, but often the best recommendations are those of your neighbor or friend. Checkable references/testimonials from third party online agencies are often considered a worthwile guide to helping you choose your preferred vendor.